Congrats to JMM Boys & Girls Track & Field on BOTH winning the 2014 Indoor City Championships. Saturday's meet is a stepping stone for the remainder of the season. 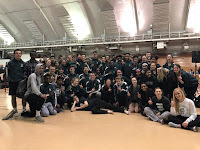 As the second meet of the season there is still much growth our teams need to make but being able win this meet in such convincing fashion AND take a step in the right direction for the season was a good day for both boys and girls programs. The boys won their first Indoor City Championships since 2007 and the girls since 2010. The girls won by compiling 123 points outdistancing second place by 66 points and the boys gathered 116 points winning by 53 points. Our team show great strength up front, depth in multiple events, and vast ability across all areas. These city championships were truly a team effort and something our programs can build off to have a terrific season the rest of 2014. The girls team scored in all 14 events competed at the Indoor City Championships. They were led by 2014 Indoor CITY CHAMPS - Natalie S in 55m hurdles (9.58), 4x100m relay (54.48), Sydney S in high jump (4' 10"), and Kayla G in the pole vault with a new Spartan 7 vault of 9' 3". Top 5 finishes at the city meet scored points for the team competition. Others scoring points for the girls were: Emma Cate M 2nd in the 55m dash (7.91) & 4th in the long jump (14' 8"), Julana DW 3rd in the 55m dash (7.94), Margot W 4th in the 55m dash (8.04) & 2nd in the 200m dash (28.90), Sarah H 5th in the 200m dash (29.92) & 2nd in the pole vault (7' 0"), Sydney S 2nd in the 400m dash (1:03.63), Meghan S 3rd in the 800m run (2:32.28) & 2nd in the 1600m run (5:38.17), Amelia F 5th in the 800m run (2:37.43) & 4th in the 1600m run (5:43.55), Siena C 2nd in the 3200m run (12:03.57), Mariah OF 3rd in the 55m hurdles (9.82) & 3rd in the long jump (14' 10.5"), Phibi M 4th in the 55m hurdles (10.01), Kayla G 2nd in the high jump (4' 8"), Natalie S 3rd in the high jump (4' 6"), Flo L 3rd in the pole vault (6' 0"), Christina M 2nd in the shot put (31' 7.5"), Holly H 4th in the shot put (30' 4"), the 4x200m relay in 4th place (2:02.69), and the 4x400m relay in 2nd place (4:26.51). The boys team scored in 12 of the 14 events at the Indoor City Championships. They were led by 2014 Indoor CITY CHAMPS - Jason W in the 55m dash (6.84), Daurice F in the 55m hurdles (7.76) & long jump (20' 10"), the 4x100m relay (46.38), the 4x200m relay (1:38.86), Hunter P in high jump (5' 8"), and Ryan B in shot put (44' 6.5") Also scoring on the day for the boys with their top 5 finishes were: Jake A 2nd in the 55m dash (6.92), Lonnie T 3rd in the 55m dash (6.94), Alex B 2nd in the 200m dash (24.66), Anthony H 4th in the 200m dash (24.96), Daurice F 2nd in the 400m dash (54.37), Jake R 5th in the 1600m run (4:50.94), Micah P 3rd in the 55m hurdles (8.46) & 2nd in the long jump (20' 7"), Ginovanni S and Zach O tied for 2nd in the pole vault (9' 0"), Hunter P was 4th in the pole vault (7' 6"), Price R was 2nd in the shot put (40' 3.5"), Sean B was 5th in the shot put (38' 8.25"), and the 4x400m relay was 3rd (3:49.12).